A Twitch layout (also referred to as a Twitch overlay) is essentially the name given to graphics that are added to a Twitch broadcast to make it look more visually appealing. Using a layout or overlay can be a great way to make a broadcast look more professional and can be much more engaging for the viewer. A stream that features only basic gameplay footage and a webcam likely doesn't use a layout. A broadcast that implements colorful borders or frames around their webcam and gameplay does. 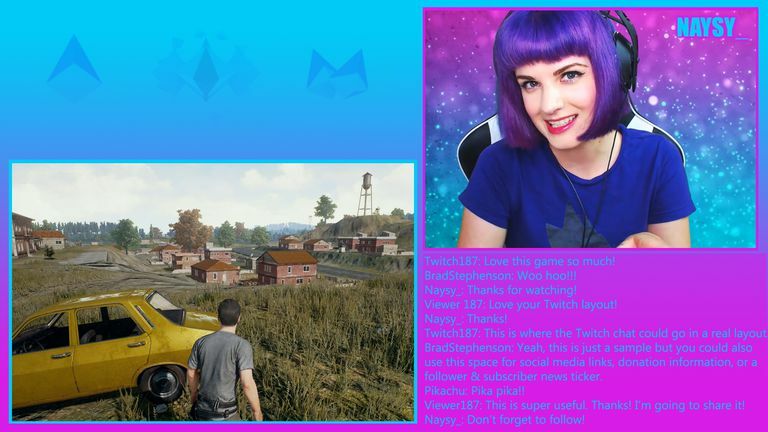 One of the best ways to add a custom layout to your Twitch stream is to design it yourself in a program such as Adobe Photoshop. For those without Photoshop, there are several free alternatives that can be used such as Paint 3D in Windows 10 or the online graphics editor, Canva. Here's how to quickly make a basic Twitch overlay in Photoshop. The steps will vary slightly depending on the graphics program being used but the overall concept should remain the same. As with most custom Twitch streaming features, a computer, capture card, and broadcasting software such as OBS Studio is needed to customize your layout. It is not possible to change the look of your stream using the default Twitch app found on video game consoles such as the Xbox One or PlayStation 4. Open Photoshop and select File and then New from the top menu. A box will pop up asking you to confirm details of your new file. Make sure that the width is set to 1920 pixels and the height is set to 1080 pixels. This will be the full size of your stream layout which will fill the entirety of a TV monitor when viewed. Using this size will help you better visualize the end result and plan accordingly. Press Okay. From the top menu, select Edit and then Fill. From the new dropdown menu, choose Color and select the color which you want your entire background to be. Press Okay. This step can be repeated until you get the color you like. Tip: You can also use a large image for your background or use the Gradient Tool for a more creative option (see above image). You should have a menu box for Layers floating somewhere on the right side of the screen. If you don't, open up the Windows link from the top menu and make sure that Layers has a tick next to it (click on it to check or uncheck it). This will make the Layers box appear. Looking at the top menu once again, click on Layer then New then Layer… and press Okay in the box that pops up. You should now have an invisible layer on top of your background. This will allow you to draw and edit your design without affecting the background color. Both your new layer and the original background layer should be visible in the Layers box on the right side of the screen. Tip: If you want to draw directly on or edit the background layer (to change its color for example), click on it in the Layers box. Switching between all layers can be done at any time via this box. With your new layer selected in the Layers box, look at the floating toolbox on the left side of the screen and select the Rectangular Marquee Tool. It should be the dotted line square icon in the top-left corner of the toolbox. Move your mouse to your workspace and click and drag the tool to create a square or rectangle shape where you want your webcam to be during your stream. Once you have the shape you want, from the top menu select Edit and then Fill and choose your color that you want the box to be. Press Okay. Tip: Later on in OBS Studio, we'll place your live webcam footage over this part of your image but we'll make it slightly smaller than your box so that it creates an illusion of a colorful frame around your webcam. Keep this in mind when designing your layout. See above image for an example of a finished design with the webcam footage in place. Notice the pink frame. Repeating the previous steps, create a new layer. On this new layer, make a box for your video game footage. Do the same for any other content you want to frame such as a chat box or new subscriber list. With each box on its own layer, you can now move them and edit them individually from each other by selecting their layer from the Layers box and choosing the Move Tool (the arrow icon) from the toolbox. Once you have everything the way you want, go to File and Save to save your project as a Photoshop (.psd) file. This is the file you'll use to edit your project in the future in Photoshop. Now that you've saved your project, go to File once again and this time select Save As. From the Format dropdown menu, select JPEG, give your file a name, and press the Save button. You're done! Your custom-made image can be added to OBS Studio the same way as other media sources are. Right-click on your OBS Studio workspace and choose Add and Image. Name your new layer. "Background" is a good idea for the layer name as it will make it easily identifiable. Press the Browse button, find your saved JPEG image on your computer, and press Okay. Your background image should now appear in OBS Studio. Due to its size, it may be covering other content so make sure to locate it in the Sources box at the bottom of the screen and drag it to the bottom of the list. Add your other media sources such as your webcam, video game footage, and alerts as per usual. Make sure these new additions are above your background in the Sources list so that they can be seen by yourself and your viewers. You now have a basic custom Twitch layout! Remember that your background image can be changed at any time by simply opening up your saved .psd file in Photoshop and editing it.